In romantic comedies and sitcoms, one trope I’ve never understood is when two guys compete for the same girl. Now, I understand what it’s like to pursue the affections of a woman while she’s also being pursued by someone else. We can’t help what we feel. The part I can’t comprehend is the primal aspect of competition: Actively trying to make yourself look better than someone else or even directly clashing with someone else, as if a lover is a prize to be won. But then I started watching the BBC series Planet Earth II, and now I get it. In the jungle, there’s a bird who clears a 6-foot radius of all leaves (living and dead) so that his green upper wings can catch the eye of a passing female before she notices someone else. In the grasslands, there’s a bird who (again) clears an entire area and then jumps as high as he can, time after time, until a female selects him. The wide shot of this happening shows dozens of birds jumping up and down across a single field. It’s always the males competing for the female attention, not the other way around. So maybe that movie/sitcom trope isn’t so far off. In fact, maybe this type of competition happens in real life and I just haven’t noticed it. I have dated a few women whom I know other guys liked, but I wasn’t aggressive about it–if the women had wanted to date the other guys, that would have been fine too. That said, I’m single! So perhaps I should have been competing all along. If I follow the advice of the birds, the key takeaway for me to find a girlfriend is to have a very tidy condo and to be able to repeatedly jump high in the air. I’ll see how that goes. What’s your favorite animal mating ritual? This entry was posted on Thursday, March 23rd, 2017 at 9:54 pm	and is filed under relationships and tagged with relationships. You can follow any responses to this entry through the RSS 2.0 feed. 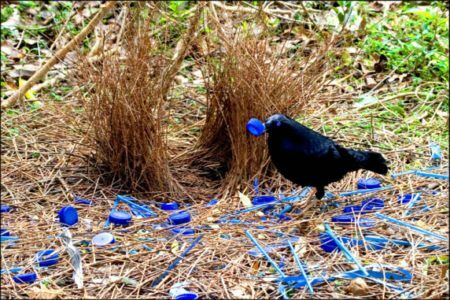 I haven’t competed like that, but I do have satin bowerbirds (the bird in the picture) in our yard on a regular basis. They are pretty awesome. Ian: That’s awesome! Have you seen their mating rituals? I’m off the market for quite a while but I can recommend starting to chitchat with women in situations where it might be less common (eg. supermarket etc.). In these situations there is less competition and it makes you look confident which is attractive. I think animal rituals are for the birds! Spontaneity is the way to go. I once met a girl through such a moment. At a club, walking to the bar, I noticed out of the corner of my eye, a girl quickly glance at my friend and me. Seizing the moment, I walked up to her and said, “Hi, I had to compliment you on your peripheral vision.” She knew she’d been caught, and burst out laughing, and the ice was broken. Now I’m not sure if that helps Tinder users, but in real life, if a moment of opportunity arises, spontaneity is king. I think I have digressed a little. On your question, ‘What’s your favorite animal mating ritual’? I too have been watching Planet Earth II, and that bird that clears green leaves in a 6-foot radius of where it does its mating ritual was fantastic. My partner and I were watching, and it was like looking at a mystery unfold – until we were caught by surprise when the camera panned directly above the bird as it commenced showing off its plumage – so unexpected, and a credit to the cameraman and editor who captured the ritual to the max. Amazing. I had the same reaction as you when the mystery unfolded on Planet Earth II. I like that they saved the reveal as to exactly why the bird wanted to remove the green leaves–the show is so well done. I think Planet Earth is doing an underwater series next, so I’ll see if that inspires a new post!